This caresheet is an excerpt from a longer article, and used by permission of the author. The full-length article is available online in Issue 1 of Caudata.org Magazine (PDF). 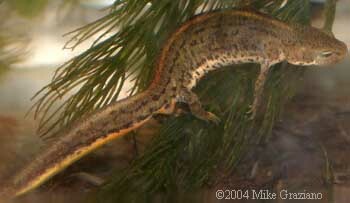 In 2005, the genus Triturus was split, and the small bodied species, including boscai, were placed in a new genus, Lissotriton. The species name has been changed in this article to reflect the current nomenclature. 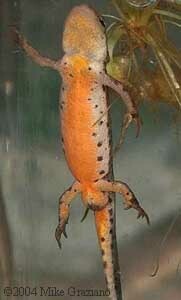 Bosca’s newt was originally named Pelonectes boscai by Lataste in 1879. In the same year, Boettger described the species as Triton maltzani. In 1882, Boulenger proposed the name Molge boscae, but it wasn’t until 1981 that Dunn included the species in the genus Triturus, and the species became known as Triturus boscai. 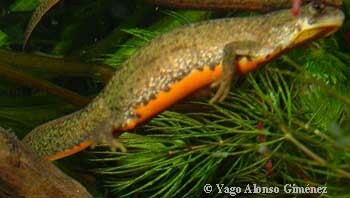 The common names for Triturus boscai in its native lands are triton ibérico (Spanish), tritao-de-ventre-laranja (Portuguese), and pintafontes común (Galician). 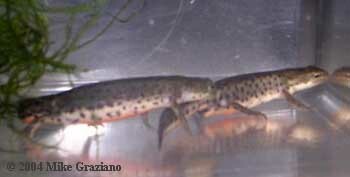 Bosca’s newts can reach up to 11 cm, my biggest female being 10.8 cm. The species varies in size depending on their genetic origin, with the northernmost populations being the largest, and southernmost the smallest. Dorsal coloration is olive, brown, broken yellow, copper, or almost black during the terrestrial phase. There may be black dots along the body. Bellies are bright red, orange, or yellow, sometimes with dots on their bellies and throats. The coloration fades along the throat and tail. The colorful belly and the dorsal color are separated by a white band. The irises are golden or copper with a dark banded line in the middle. The skin is shiny and smooth during their aquatic phase and a bit granular during the terrestrial stage. The parotoid glands are very visible. The tail is very compressed laterally and can develop a low crest. The length of the tail is normally the same size or even longer than the body length. As individuals get older, their color fades towards brownish with yellow marks. Some very old individuals fade to a whitish belly color and a broken yellow copper color on their backs. A very characteristic trait of male Bosca’s newts is that they have dorso-lateral ridges, giving them a square looking appearance. It is also quite common for males to have black marks in their backs and sides. During the breeding season, the male’s cloaca gets very rounded and enlarged with a long, obvious opening. They also may develop a small tail crest and a tiny filament smaller than 2 mm at the end of the tail. During this time, males develop silver highlights along the white band between the belly and sides, and especially along the tail. In relation to the body length, the limbs of the male are longer than those of the female, and the males are about 20% smaller than females. The female has a rounded torso and the cloaca is conical and pointed backwards. Females are usually darker than males, with a beautiful dark olive color. The vertebral line is often visible. 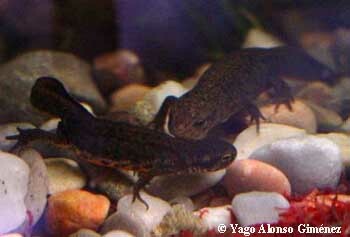 Eggs of Bosca’s newts are very easy to distinguish from other Triturus and Lissotriton. The eggs are oval with a clear dark upper side and a whitish underside. Egg diameter is around 2 mm, which is large compared to other Lissotriton (L. helveticus, L. vulgaris, etc.). Newly-hatched larvae are 7-12 mm in total length. Interestingly, larvae of Bosca’s newt, which is classified as a pond-type newt, have very prominent gills and develop all four legs early compared to related species. Their coloration is pale brownish-orange, and they often have tiny dark dots along their body. Their belly is yellowish with tiny dark dots. In behavior, Bosca’s larvae are very voracious and dwell at the bottom and on floating plants rather than suspended as some larvae of the cristatus group do. Larvae metamorphose at a size of 20-35 mm. Curiously, some late larvae from northern populations may spend their first winter aquatic (paedomorphic), metamorphosing the following spring or summer at a body size of 50-75 mm, nearly adult size. Juvenile coloration is brown or grey, sometimes with blue and yellow tones with darker spots on their backs. Initially, their bellies are whitish or yellowish. After 15-45 days, the belly color develops. The brightness of the belly depends on their diet during the larval and juvenile periods. Bosca’s juveniles are completely terrestrial in nature until adulthood. Adulthood is reached at 2 to 4 years of age. 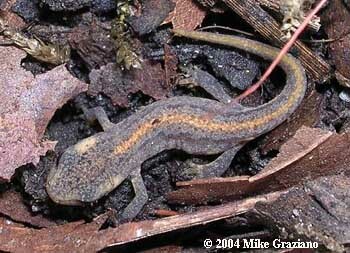 Bosca’s newt is an endemic species of the Iberian Peninsula. It lives in Portugal and the western part of the Iberian Peninsula: Galicia (even on the island of Ons), Asturias (Picos de Europa being the eastern limit), Castilla y León, Salamanca, Madrid, Extrermadura, and Andalucía. There are exceptionally small individuals the southernmost populations of Doñana (Huelva). The species occurs from sea level (30 meters in Doñana) to 1870 meters (Estrela Plateau). Their climate zone is characterized by being Mediterranean oceanic and continental, with moderate temperatures (yearly average 12-15ºC) and rainfall less than 1000 mm per year. L. boscai live in a great variety of environments, including eucalyptus forest, pine woods, oak woods, wetlands, country yards, fields, agricultural ditches, mines, caves, temporary pools, ponds, ditches, deep lakes, rivers, streams, moderately rapid brooks, etc. Bosca’s newts have a high pH tolerance. They can be found in water bodies from pH 4 to almost pH 9. Acidity does not seem to affect adults, larvae, or even egg development. On land they can be found in a great variety of soils from damp to rocky or even sandy soils. 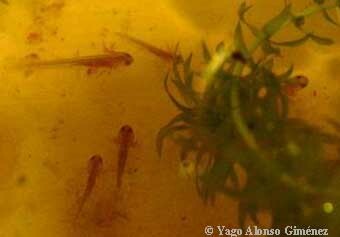 Bosca’s newt is an endangered species in Spain and protected by national law. There are healthy populations in northern regions such as Galicia, but it is very rare and endangered along the southern border of its range. The situation in Portugal is very different, since it is not a threatened species, and it is quite common throughout the country. Bosca’s newts can be kept equally successfully in completely aquatic setups or in paludariums all year long. It is a very aquatic species, so terrestrial setups should be used only during summer months when temperatures are constantly over 20°C. I keep them in fairly large setups (100x40x40 to 140x60x70 cm) due to my devotion, though they can be kept in relatively small aquariums equally successfully. It is not an aggressive species, so several males can be kept together. Water depth does not seem very important. I have kept adults in water depths from 10 to 50 cm equally successfully. However, it is very important to avoid water depths above 10 cm for juveniles being kept aquatic. I highly recommend well planted aquariums since females of this species like to rest in floating plants waiting for prey (waxworms, flies, crickets… all are much appreciated). Males, in contrast, are bottom dwellers and fairly active, always looking for females, since their breeding condition can last for more than 8 months. It is a very curious species, so wood or complex rock structures with holes are much appreciated. Keep in mind that if a false background or any decoration has an unexpected gap, a Bosca’s newt will undoubtedly crawl in. 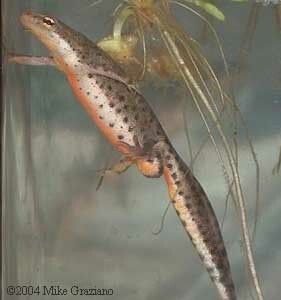 These newts can be kept in still or moderately flowing water. Ideally, they should be maintained at no more than 20oC during the warmest part of the year. In winter, their temperature can drop to 4oC without risk. Southern individuals will tolerate temperatures up to 25ºC for short periods of time, but a decrease in temperature at night is essential. If you cannot keep temperatures cool enough in summer, I highly recommend that you to keep them completely terrestrial. This is a species that doesn’t need to hibernate, even though it tolerates and remains active at very low temperatures. It is not tolerant of high temperatures, so summer aestivation should be always provided during high temperatures. They can be kept outdoors during summer months in order to provide a natural temperature drop at night. Bosca’s newts will burrow into the substrate as temperature increases. Feeding usually takes place at twilight hours. However, Bosca’s newts are quite voracious, so they will accept prey anytime. When kept aquatically, these newts will eat nightcrawlers, daphnia, whiteworms, live or frozen bloodworms, live blackworms, tubifex (live, frozen, or dry), live brine shrimp, beef heart, beef liver, chicken liver, chicken heart, pellets, etc. When terrestrial, these newts will take crickets, waxworms, earthworms (not the red-ringed species though), whiteworms, fruit flies, etc. I recommend gutloading crickets with flaked fish food or cricket gutload prior to feeding. Mineral supplements are not required if a varied diet is provided. However, I highly recommend adding color powder and vitamin powder to juveniles’ food. This should be provided until the juveniles reach a reasonable size when a wider variety of food and therefore a more balanced diet can be supplied. First, adults must be healthy and well fed all year round in order to succeed in breeding. Well-fed females will guarantee a great number of eggs. Bosca’s newts can be kept aquatic all year round, and a moderate variation of water temperature is enough to elicit breeding condition. A yearly range of water temperature between 20ºC in summer and 12ºC in winter is sufficient for breeding. However, much lower temperatures are tolerated, and these lower temperatures will prolong their breeding condition for months. If kept terrestrial, a greater temperature variation is required. Keeping them outdoors or in a cool place for a couple of months with day temperatures around 10ºC and a few degrees lower at night will be enough. During courtship, the males are very active, constantly looking for females. When a female is detected, the male approaches her and starts tail fanning. The tail is folded against the side of the body nearest the female and oscillated rapidly. When the female shows a clear sign that she is seduced by the male’s visual and olfactory cues, he will do the flamenco by raising up the tail from the body waving the silvery ending from side to side. Then the sperm mass will be deposited. The male will start moving about and his tail will perform a wiggle, which moves the tail in a serpent-like movement. The female will follow the tail’s shiny silvery ending, and the male will direct her to the position where the sperm is. Then, the male will start flicking the female repeatedly in order to move her cloaca forward and backward with the aim of catching the sperm mass with her cloaca. The male may start doing the flamenco again since several sperm masses can be deposited in one courtship. L. boscai male with spermatophore (circled). L. boscai female laying eggs. Females may mate several times a day with various males during the whole breeding season, but eggs won’t be laid until water temperatures are above 11ºC for a period of time. The females will start folding leaves and doing the egg laying ritual, but without eggs for some hours or even a few days. Females may produce 100-250 eggs in a season, and their oviposition lasts between 50 to 100 days. Water temperature will affect the number of eggs laid each day. Eggs are deposited singly, and folded between leaf tips of submerged vegetation, partially submerged moss, holes in wood, etc. 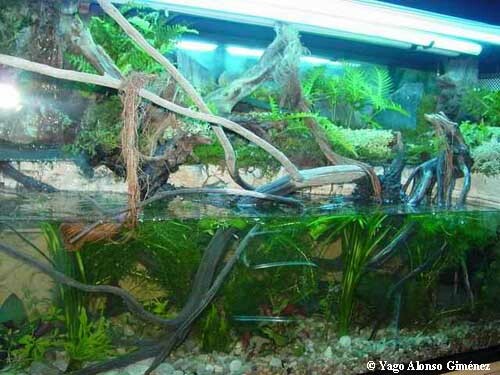 For captive rearing purposes and for ease, it is highly recommended that Elodea/Egeria plants or plastic strips be provided in the breeding aquarium. Every week or so, you should remove the strips or plants as they get covered with eggs. Don’t forget that adult Bosca’s newts enjoy eggs as a meal. One can use plastic boxes as the rearing setup with plenty of plants and bare bottoms. The larvae will hatch from the eggs between 12 days (at ~20Cº) and 25 days (at ~10Cº), depending on water temperature. Initially the larvae will nourish themselves on yolk (vitellin) while their organs develop. After 60-80 hours, the balancers, which permit the larva to stick to vegetation, are absorbed and the larva begins swimming freely and hunting for food. Keep in mind that Bosca’s larvae are very tough, since a wide range of pH is accepted (4-9), and the water quality is not a critical factor. For the first stages of their development, I feed the larvae by using pond water along with small invertebrates captured with a net. As they grow, other foods may be provided, such as live daphnia, brine shrimp, live tubifex, frozen bloodworms, chopped earthworms, etc. At metamorphosis, it is necessary to lower the water level and provide some surfaces out of the water. What I do is to incline the plastic box in order to get a dry area which I cover with moss. Bosca’s juveniles are very delicate and not easy to raise. The correct care for the first 3 months is essential for their success. Avoid temperatures higher than 20ºC, preferably keeping them under 18ºC. The size of the just-metamorphosed juveniles is also important to their success, so try to get the larvae as large as possible by providing plenty of food and keeping the water temperature low. It is quite helpful to feed them extra just before they leave the water. A size of 3 cm or more is reasonable to succeed in their development. For terrestrial rearing, I put the newly-metamorphosed juveniles in a setup with plenty of moss. Every week or so, I replace the wild moss, which is full of small organisms. I complement this diet with small crickets, small waxworms, fruit flies, chopped earthworms, and live tubifex, which I place on a wet surface. Since the color of the belly develops during the first 15-45 days after metamorphosis, it is critical to provide foods that will allow the belly color to develop properly. I recommend dusting the food with amphibian color powder and vitamins. If you plan to have aquatic juveniles, I recommend a decrease in water level to 1-2 cm before metamorphosis with plenty of plants in the water (Java moss and Elodea work great). Plants above the water level should not be provided, as the juveniles will use them to remain out of the water. The juveniles should always stay in the water and feed in the water. A few weeks after metamorphosis, I gradually increase the water level. The secret is to keep them in cold oxygenated water (8-15ºC) with plenty of live food (cyclops, daphnia, tubifex, earthworms…) and frozen food. 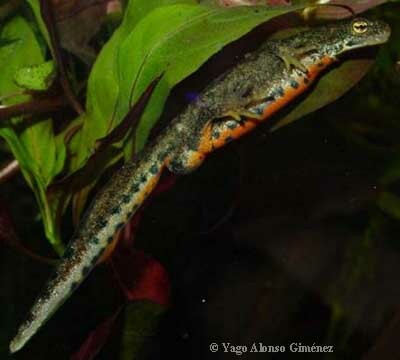 In an extreme case, I have (in May 2004) a juvenile from spring 2003 that is doing great in the same aquarium with adult Bosca’s newts with a water level of 50 cm. The key is that the aquarium is well oxygenated, and the temperature is always under 15ºC. © 2004 Yago Alonso Giménez.